I remember a few years back, when I was convinced that I am a headphone only guy and that I prefer headphones to speakers. At that time, I had my headphone setup in the living room, on a desk near the couch that was facing the TV. At one point, after I finished a music listening session with my HD800 / Audeze LCD-3, I decided to watch a movie. The sound was coming out of the speakers embedded in the TV. At that point, I remember thinking that I just can’t go on like that. A funny dramatic moment…first world problems to other people. The difference was just too big to enjoy the movie. When was watching movies alone, I used the headphone system, but couldn’t do that with my wife. Then, I had a very innocent thought: “I should buy some small bookshelves that would make the movies more bearable to watch”. I immediately thought of the cheapest version of bookshelves speakers that managed to impress me a lot: Indiana Line Nota 250. When I went to Jack-Fi/AudioConcept, I was offered a good deal for the Focal Aria 906. This was in October 2014. Of course I had to buy a speaker amplifier and I went with Audio GD Precision 2. Then from Focal 906 I went to Piega Premium 5.2, then to Focal Electra 1028, then I moved to a bigger apartment. I reserved a room to be my audition room/office. The lovely Electra 1028 sounded like crap in my new room. This is how I found Martin Logan, and I moved from Electra 1028 to Martin Logan Theos. So I had a dedicated audio room. Guess what, the big TV was in the living room. Back to square 1. I got decent pair of speakers, Martin Logan Motion 40 and an Arcam Solo Music. In that system upgraded the speakers to Piega Coax 30.2 and a Soekris 1541 R2R Dac. If you have read my review of Focal Electra 1028BE, I really loved those speakers. They sounded marvelous in my old apartment’s living room. When moving into the new apartment, I was really excited to have a dedicated audio room. It’s not big…it’s only 15 square (3.3 by 4.6) meters with a height of 2.75 meters, but I did not expect them to sound so bad. In all fairness, two walls are made out of plasterboard and it totally screwed up the lower frequencies. Talking to my dealer, he suggested that it would be easier to try other speakers than to treat the room, so this is how I got to Martin Logan Theos, which sounded quite better in the room compared to the Electra 1028. I was also really impressed by the transparency of the sound and the size. I was still not happy with the bass so I upgraded to Martin Logan Ethos. The sound improved, but I still had problems in the lower frequencies. I got a mini-dsp measurement microphone and I used REW to measure the speakers and the room. I managed to remove the huge peaks I had, especially on 55 hz (around 25 db) and on other higher frequencies. This got me the sound I was looking for. The room was still limiting the bass section, but in all the sound was lovely. When Martin Logan announced their new upgraded line, I took the plunge and went blindly for the Martin Logan Impressions ESL-11A. The speaker panel size and the room measurement / bass correction dsp helped me to make the upgrade decision. I am going to apologize for the pictures. It’s very hard to make them photogenic in my room with the gear I currently own. These speakers are huge. I had to rent a truck to bring them home from Jack-Fi, the Martin Logan Dealer. This is mostly because of their huge woofers that are actually extending a lot in the back of the speaker. The woofer is actually about twice the size of the one from Ethos. The build quality improved a lot from Ethos and it was visible from the first minute. The woofer is made of natural hard wood. The frame is made of Aerospace Grade Extruded Aluminium Alloy. The frame actually extends under the wooden speaker as well. From what I know that is where the amplifier for the bass section is too. There was a major leap in build quality from Ethos to ESL-11 and this was obvious to the naked eye. They are a pleasure to look at and might be in fact wife proof. Let’s get through some specs and interesting technology features. Low Frequency Transducer Two 8” (20.3 cm) cast basket, high excursion, rigid aluminium cone and extended throw drive assembly, non-resonance asymmetrical chamber format. Impedance 4 Ohms, 0.6 at 20kHz Compatible with 4, 6, or 8 Ohm rated amplifiers. Signal Inputs WBT-0703Cu nextgen™ 5-way binding posts feature a filigree signal conductor made from gold plated, nickel free, non- ferromagnetic, pure copper for high conductivity and fully insulated. Free from eddy current effects. Impression ESL 11A XStat panels are joined to their speaker cabinets using MartinLogan’s redesigned AirFrame Blade construction, precision manufactured from an aerospace-grade extruded aluminum alloy. This material, and this exclusive manufacturing process, makes the panels extremely rigid. 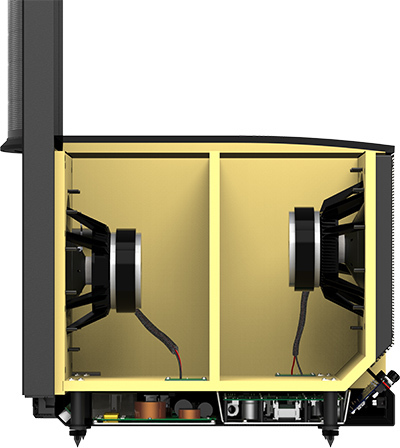 For the first time in electrostatic speakers we are introducing the integration of exclusive Anthem Room Correction (ARC) technology. By engaging ARC to control the low-frequency curve in relation to the output of the ESL panel (as seen in this graph), you will experience performance on par with MartinLogan’s audio test lab. You cand find more details here. However, I did face a few issues, but this is also because of I am not actually fair to these speakers, offering them a very small room to play in (15 square meters, 3.3 by 4.6). They need about 76 cm from the side walls, and I only gave them about 40. I played with toe in, toe out and tilting them back and forth till I got the sound I wanted. Also, with these speakers, don’t put sound absorbing materials right in the back of the speakers as it will just dull up the sound. So, yes, I did manage to make them sound awesome, but I think they can actually do so much more in room with appropriate size and sound treatment. This being said, I have to say that even in these conditions I can say that they sound better than the older Martin Logan Summit X, which was their flagship before the new line. Yes, I am not kidding! I take my hat off to Martin Logan. I’ve seen very few High End Audio Companies to release an upgraded line of products that has the first product in the line to be better than their former flagship at half the price. Martin Logan Summit X was also a splendor in sound quality, but the ESL-11A sounds considerably better at half the price. Respect! The green graph is the one with the correction applied, while the black one is the ideal response. So yes, before the correction, the sound was a mess in the bass section, and the correction was obvious in the sound from the first second. One note here is that I don’t have a lot of experience in measuring audio gear, so be patient with me. I am learning on the way. Any observation / suggestion will be appreciated. It’s not perfectly linear and the ARC did not manage to take care of the dips generated by my room, but it is much better than without it. I still have to do some digging on what I have to do to get rid of the big dip I have at 40 hertz, but this is not the speaker’s fault. “If you have dips, here is what the general recommendations are…” . I specified “general” as some solutions would be different from room to room. I do have some higher distortions in the area where I have the dip and near 30 hz, but after 300 hz I have distortions under 0.5%, and after 500 hz as you can see it plays around 0.2%. There are headphones that can barely achieve this, and remember this is in a 15 square meters untreated room. The distortion levels are amazing overall. It’s no wonder why the sound is so clean, so transparent. One other thing to mention here if you didn’t already notice, is that the bass section is active, meaning that from 20 to 300 hz the speakers have an internal amplifier to handle those frequencies. You can also play with the sub bass and mid bass adjustment directly from the speakers. With the ARC activated, I didn’t feel this to be necessary, but it’s fun to play, especially with the mid-bass toggle. The level of transparency these speakers are capable of also translates in hearing any component the upper chain. Regarding the amplifiers, I can’t say I found the perfect one for them yet, but I did find some good matches recently. This is actually one of the reasons I have postponed this review so far. I feel like the speakers can do more, even though I already had audio nirvana moments with them. With Agd Master 10, I got really good, intimate, present and emotional midrange, but lost in energy, air and treble detail, but also soundstage depth. Some of these issues were curiously solved when pairing Master 10 with Plixir BAC 1500. Never heard that amplifier so dynamic and full of life as with plixir. With ECI-6, I got considerably better treble detail & air, considerably bigger and more holographical soundstage, good energy and details on the whole frequency range. On the longer term, I felt that I lost some of the midrange presence and purity/transparency. The Raimond DM-120S was the best match I found so far, if I think about it. It has infused a lot of energy, speed and details into the scenes, having excellent details on the whole frequency spectrum. I got excited on a lot of songs that I did not know were capable of such lively energy. Some people might have found this combination a little too raw, maybe some lack of finesse, but I absolutely loved the combination. I also recently got an upgraded version of the Raimond Audio Audiophile Starter which really impressed me. It did not have the energy of DM-120S, but what I liked about it was the level of transparency it was capable of, and the fact that it kind of does everything right in the sound. I have read a lot of impressions on older Martin Logan models, saying that the bass is not on the same level with the midrange/treble – electrostatic panel sound and the integration between the two is not excellent. I actually felt like this issue was removed even from the previous line of Martin Logans, as I have owned both Theos and Ethos models. However, when it comes to ESL-11A, this is totally out of the question. They really raised the bar with the new series. While I do have some problems in the room on 40-50 hz range, I still can say that the bass section is gorgeous. It has better control than the previous series, more details and it can go quite deep if the room permits it. I also think they did an amazing job with the ARC (Room Correction) system. It really solved the most important bass problems I had in my room and this was a major deal for me. I really can’t imagine other speakers of this size that could fit and sound at this level in my 15 square meters room. Oh man…. This is where the magic’s at. The midrange is so pure and so natural that it flows directly into my heart. The voices are right there with you, both female/male voices, so clear and present that it creates a really intimate sound experience that is not necessarily very common with speakers. What I mean to say is that the size of the sound is….not comparable to conventional speakers, that after a while might start to sound small. The instruments are pure, detailed and very coherent. It’s very apparent that the big electrostatic panel produces frequencies between 300 hz and 23 khz, that it has very low body mass and that it doesn’t have any crossover present here. I’ve rarely heard them to sound so coherent or life like on other speakers. For example, I’ve rarely heard a violin to sound so life like on other speakers. The treble is superb if you find the right amplifier to do the job. Yes, ESL-11A goes down at 0.6 ohms in 20 Khz. While you shouldn’t panic over this, as it doesn’t require a lot of power in 0.6 ohms, it might still be a challenge to find the right amplifier to do the job. When you have it right, the treble will be both smooth and detailed in the same time. It’s not harsh at all, but it is quite detailed, very natural and sparkly. There are speakers that have more detail in this region and a little more air (Focal Electra/Utopia, Piega Coax 30.2), but are not capable of the level of realism and the natural detail the ESL-11A manages to transpose in this area as well. These speakers just amazing when it comes to clarity and transparency. The sound is so pure and clear that it’s like opening a big window/door into the music itself. As you can read above, this can also be seen in the measurements. If you are used to very clear / low distortion headphones, these speakers might very well be what you are looking for. Not sure it can get much better than this. ESL-11A is capable of great detail reproduction, but it’s not in your face. The exposure of the details is done in a very natural way and it’s not throwing them unevenly at you. It’s like a life like experience, listening to the singer / instrument right in front of you. The size of the sound…is enormous compared to conventional speakers. It’s really obvious that you have a huge panel producing both mids and treble, compared to a smaller speaker driver from conventional speakers. I am not even using them in the right conditions, as they need space to breath from the side walls (at least 76 cm and I only gave them 40). I actually tried them on the other side of the wall and I was astonished of how much they opened up even further. I dare you to find other speakers that you could fit in an untreated 15 square meters room and make you feel like in a concert hall. This might also be due to the fact that some of the energy also comes from the bass section and the punch and speed of the bass are awesome! The tonality is very natural. I would actually go further and say it’s realistic. I heard some other really good speakers, but in this case I really felt like in the concert hall or like having the singers with me in the room. I have also tested with some orchestral choral music recorded in Westminster Abbey and it was really close to the real life experience. Of course, this is not only from the tonality, but the voices and instruments sound really well textured, natural and their presence in the scene is amazing. Since the Ethos was the speaker from the previous line within a similar price range, it’s only fair to do a small comparison. I did manage to make Ethos sound quite nicely and I was happy with them. I managed to get a mid centric sound with good weight, natural tonality decent details and good transparency (especially on the midrange). What I didn’t like about them was that the bass was not very well defined under 100 hz (this was also a result from my room problems), but they also sounded a little dark, and the treble was not fully extended, it didn’t sound completely natural. ESL-11A is in a completely different league. The sound was improved in all aspects. There are new layers of details and realism in the music on all the frequency range, from bass to treble. The sound is more coherent, the transition from bass to midrange is considerably better, the soundstage is bigger and more holographic, the instruments are better defined, more space between the instruments and better energy/prat. When it comes to the treble, this also was a major improvement over the Ethos, with better extension, more air and considerably more natural sounding treble. With ESL-11A the realism is in a different league and transposes you into the concert hall with your favorite artists, or it transposes your favorite artists in the room with you. These speakers don’t come cheap, but I consider to be better than Martin Logan Summit X, the flagship speakers from the older line, and this is for half the price of what the Summit X used to cost. I have seen very few Audio Companies to release a product half the price and with better performance than their previous flagship. I have recently introduced Tudor, my newborn baby to them and he was also very impressed. Believe me, he usually is not that calm. He really seemed to enjoy the music & sound quality. I might have an audiophile baby. Letting aside this comparison, they became a reference for me when it comes to realism and transposing you inside the music. I have listened to considerably more expensive speakers and the ESL-11A can standup to all of them. They are hard to beat at any price. The ARC Room correction is really helpful for bass related issues. Very natural, holographic sound-stage. The level of realism is hard to beat. I would want more details and support for the ARC room correction, covering the limitations, known issues, room treatment examples, etc. For example ARC fixed the peaks but not the dips in my sub bass. Maybe this is a known issue related to the speaker placement, room issues, etc. It can be finicky until you get the right position that offers you the best sound quality. Because they are kind of heavy/big, not easy to move them around or tilt them back/up. The spike adjustment is not very easy at the moment. It takes a while until you level them out, if you want to tilt the speakers from the spike level height. very nice and detailed review – your MLs are beautiful and it seems they sound equaly good! Can you please share a few details about your REW measurements? When you made measurements were both speakers playing or only one? How far nad at which height was microphone? Where was the microphone pointed during measuremetn with REW? Is the green line result of your repeated measurement with microphone or is that a simulation calculated by ARC? Thank you! I actually respected the measurements procedures described by the software and manual. The microphone was pointed up as stated in the arc software. I have measured a few points (5 points: 1 central, 2 in front, 2 in back) as described by ml near my main listening spot and around it. The microphone was at approximately 1m height (almost near my ears when I am sitting on the couch and listening to music, in this case a little bit lower than the ears). The green line is a result of the software after combining all of the measurements from each of the 5 points in the room it was measured at. For each point it does 2 fr sweeps. I have few more questions. Regarding the ARC software: I believe red line (which is not showed) is a combined result of your measurements. Violet line is after bass managemenet setting has been applied to the red line and, as green line is labeled “corrected + bass management” I actually believe that is a calculated response what ARC believes would look like after correction is applied. In ideal case something similar to that you should get when measuring with REW. Can you edit the target (black) curve in ARC? If you can I would suggest that instead of being flat at 73dB you make it sloped downward in a way that it is at app 78dB at 30Hz and then falling down to 73dB at 300Hz. Now, regarding your REW measurement: is that a single FR sweep of a single speaker? Which REW version are you using? I believe violet line is actually a result of your uncorrected measurements and green line is calculated response which shows how ARC expects the result after the correction to be. In ideal case this is what you should be getting when measuring in REW. I’m guessing that you have shown a single sweep in REW but I suggest you do 5 sweeps covering approximatey the same area that you did when doing measuring with ARC. You should then go to ALL Spl tab and generate average of those 5 measurements. Phase is easiest and most accurate to measure when microphone is close to the speaker (say 40-50cm), single sweep is enough in this case. You can adjust scale by pressing Limits icon at the upper right corner of the REW window. Looking forward seeing your results! The violet curve is what arc measured, the black is the target that it has to reach and the green is what arc calculated to reach after the applied correction. You can choose a few types of targets that mostly influences sub bass. For the target line you have to chose some predefined algorithms that give you the form of the line, but you can’t go into very much fine tuning there. That was indeed a single channel. I think I forgot to add the second to the graph, but it was pretty similar. ARC has 5 positions and each one has two sweeps (this is not customizable). With REW, I can play, indeed. I forgot the exact version of REW I had when I wrote the review. (I just moved to a new computer). Will try to do more measurements when I get some free time. You asked me on my facebook page if someone is moderating. I am, but on rarer occasions these days, as I have less time for headmania lately (toddler + work). – you need to measure separetey left and right speaker but you also need to measure when both speakers are playing to make sure there are no cancelation between them in the 20Hz-250Hz region. – if your mutliple REW measurements confirm your initial result curve in REW you may try to raise the dip point at 40Hz in the target curve to try to prevent ARC to reduce the peak too much. Here you should keep in mind that human ear is more sensitive to peaks than to dips. It’s a pity you can’t move away speakers further from the corner as that is probably the reason why ARC is having some difficulties EQing the response but in general, the curve from the REW doesn’t look too bad to me.